Attending Weddings in Goa is an experience in itself. That nostalgic feeling. A week-long festivities that you wish would never end. Pre-wedding traditions and customs that are fun-filled and interesting too. Weddings in Goa starts with a tradition called the “chuddo” which takes place at the bride’s maternal uncles house. All the ladies of the neighborhood attend the ceremony. They sing dulpods while the “volar”, the person who sells bangles is seated at the center and he places a beautiful set of colorful bangles on the hands of the bride to be. The other ladies then follow and it’s truly a beautiful sight. The next custom to be followed for Weddings in Goa is the “Ros” that takes place at the couple’s respective homes. This tradition although meaningful is fun. Here the couple is anointed with coconut milk by the family, friends and all those present for the ceremony. It symbolizes the beginning of the couple’s new lives. This ritual is believed to cleanse the couple before the wedding. But that’s not all. The fun part is where friends enjoy breaking eggs over the couples heads and some even add ice to the coconut milk. The third tradition is the “Bhikaraimche Jevon”. A mouthwatering buffet is laid with traditional Goan cuisine. This is done in memory of the departed ancestors to invoke their blessings. This brings an end to the pre-wedding rituals of Weddings in Goa . Then comes the big day. A day to remember. It starts with the family blessing the couple at their respective homes. They then have nuptials where the couple exchange rings and are declared man and wife. The entire wedding entourage then heads to the reception venue where everyone awaits impatiently. Here is where the fun doesn’t stop. The decor is a treat for the eyes. A lavish banquet is served that’s fit for a king. Music and dance continue till late night and no one really wants it to stop. This time is the most joyous and wonderful for friends and family that attend Weddings in Goa. The next day where finally comes an end for the big fat Weddings in Goa. They have the tradition of “Apounne” or “Portonne”. The groom’s family is invited over to the bride’s house for a grand party bringing the weeklong festivities to an end. In between all this many more traditions and customs are held where everyone takes part enthusiastically. That’s how our big fat Goan weddings are and if you’ve been to one then you’ve truly found yourself a treasure of memories that you’re not going to forget anytime soon. 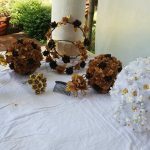 Bridal accessories – what to look out for? 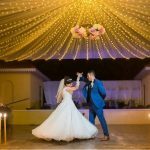 Is your Wedding Business Digitally Connected ?